I don’t know why I haven’t written about this, but I guess I should tell you about something special I’ve worked on a few months ago. 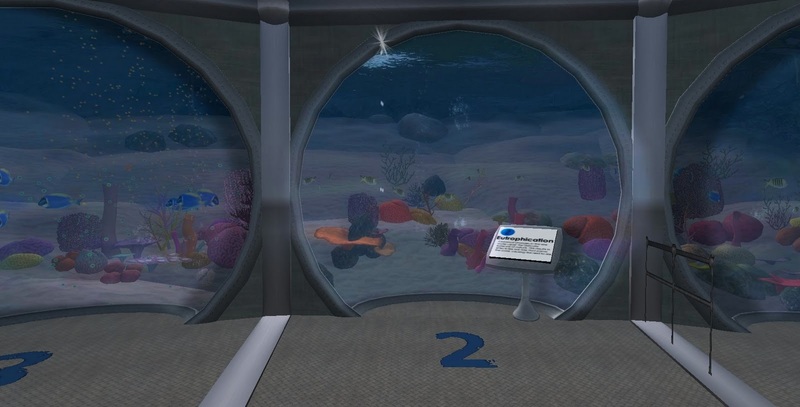 My team and I have completed construction of a lifelike virtual coral reef on contract from well-known SL entrepreneur Veritas Raymaker. Veritas, if you don’t know him, is perhaps the most polite person in the known universe. He’s been putting together a rather interesting series of educational displays on Praxis island. 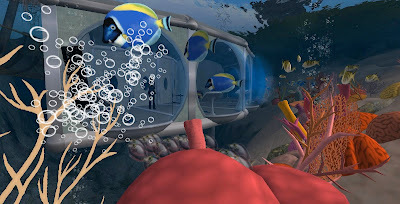 Our build is actually hidden underwater in an air-tight platform from which you can observe the coral reef. 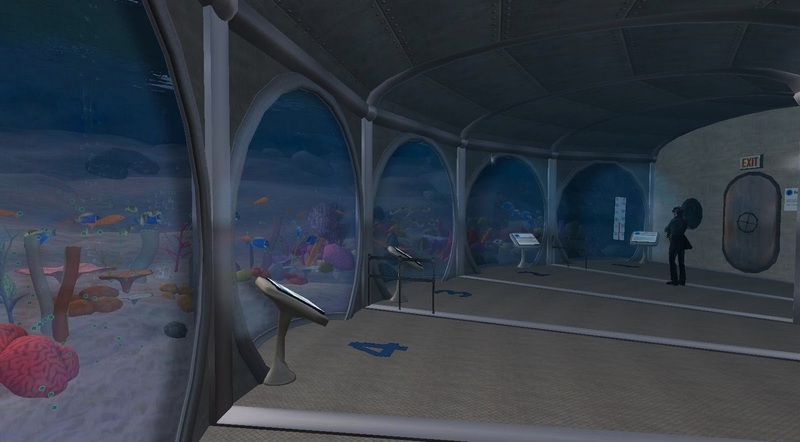 But it’s more than that - the display is organized into several interactive displays, each describing and showing you how coral reefs can be damaged. The displays take you through a short sequence explaining the issue in chat, as well as demonstrating the effect for you to observe directly. 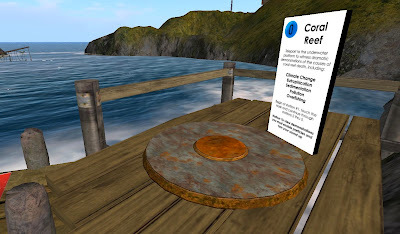 The build illustrates several real environmental factors that can affect the health of the world’s coral reefs: climate change, pollution, eutrophication, over fishing and sedimentation. Each of these effects are actually in play today in our planet’s coral reefs, and from the platform you’ll be able to see exactly how they affect coral ecosystems. 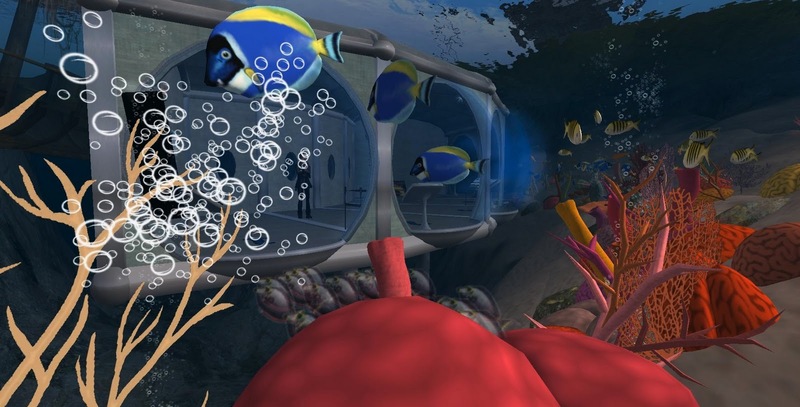 There is a separate station for each of the environmental factors, each with a dedicated observation bubble through which you can see a lively coral reef, complete with colorful corals, algae, bubbles and some of the most amazingly realistic fish you’ll ever see in SL. 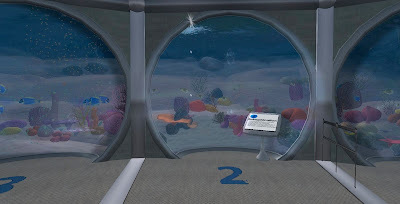 To visit the underwater platform, you’ll have to teleport to Praxis, a truly beautiful sim where Raymaker has organized a variety of environmental displays. 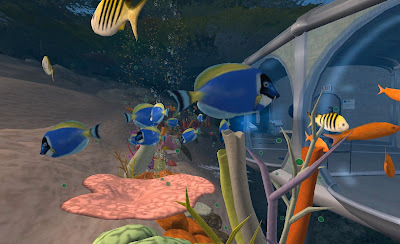 Follow the paths down to the dock - you won’t see the reef or the platform, as they are completely submerged. 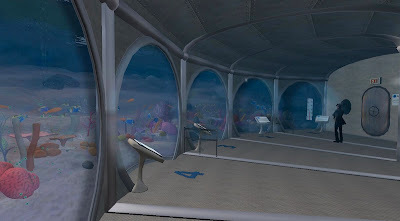 A the end of the dock, you’ll see a teleporter that takes you underneath the waves directly to the platform where you can engage the interactive displays. Start at station one by touching the display and reading the text. Be sure to look out the observation bubbles to see the coral reef die as the effects take hold. The reef build was a team effort, made by the new Construction Division of Electric Pixels. Scripting and Sculpting was done by the very capable Thickbrick Sleaford, who by the way is available for complex contract scripting work through Vermont Enterprises; Design, storyline, signage and particles was done by myself; Quality control and testing by Haley Salomon. If you’re looking for someone to help you produce an amazing display, please consider Electric Pixels - Construction Division. One catch: in order to receive the full immersive experience, you should turn on particles in your graphics settings and also turn up your sound. Give it a moment to load, especially if you have a less-than-new PC. Here's a direct link to the start of the display at a dock near the underwater platform. Enjoy!